All three major amusement parks (Walt Disney World, SeaWorld and Universal Orlando) provide assistance passes for people with disabilities. You can get them at Guest Relations as you enter the park. However, the passes are different at each park, in both appearance and how they can be used. Below is a summary of the assistance pass for SeaWorld Orlando. Tip: Keep your Assistance Pass in a separate zipper-style plastic bag so it doesn’t get ruined on the wet rides. Tip: If your special needs child must remain in his/her stroller during the queue, make sure you ask for the "use stroller as wheelchair" accommodation. SeaWorld's Accessibility Guide has information that may be helpful. SeaWorld’s Ride Accessibility Pass (RAP) is similar to Universal Orlando Resort’s and Walt Disney World's pass. After you enter the park, turn the corner to the right, and Guest Relations is in the row of buildings on the left-hand side. Upon arrival, explain to the cast member that you need an assistance pass that enables your family member to not wait in the regular queues because they have difficulty waiting for long periods of time. For our son, being in his presence about two minutes is enough explanation that he has a disability and needs the type of pass that allows us to not wait in regular lines. Other families may need to prepare themselves with a list or written explanation why their family member needs accommodation, insuring they cover the significant factors when explaining to the Team Member why their family member can not wait in the regular queue. Some guests may bring a note from their medical provider but it is not necessary and most likely won't be read by the Team Members at SeaWorld. If needed, request a stroller as a wheelchair tag to be attached to your stroller in order for your child to stay in the stroller throughout the queuing. 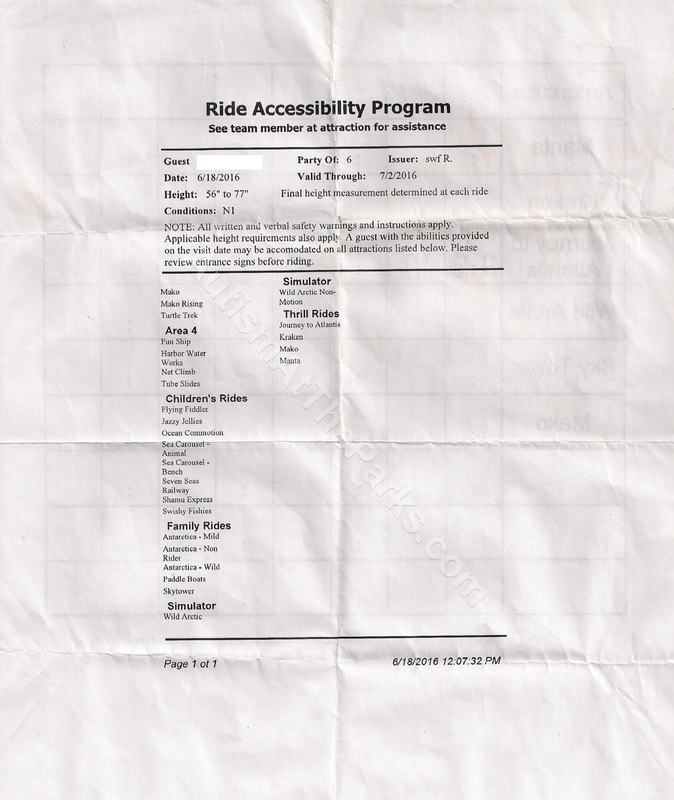 You will be provided one pass in the name of the person with a disability that also allows up to 5 additional guests for the rides and attractions listed on the front of the Ride Accessibility Pass. 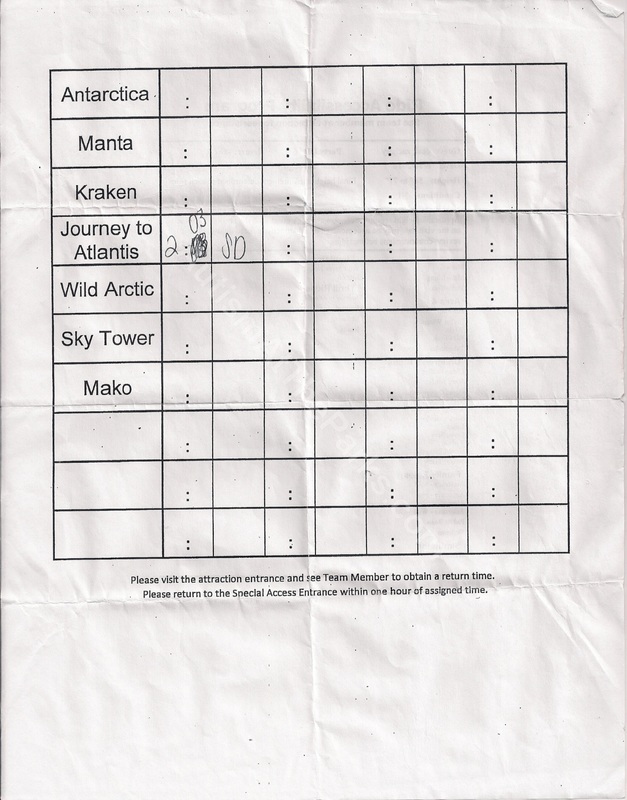 On the back of the pass, seven attractions are listed that now require a return time in order to avoid waiting in the regular queue. Rides and attractions not listed on the back can be accessed though the alternative entrance, which is typically the exit to the ride or the Quick Queue line. 1. Go to the regular entrance of the attraction you wish to ride. 2. Present your pass to the cast member at the ride’s entrance. 3. If the current wait time is less than fifteen minutes, you will be directed to get on the ride. 4. If the current wait time is more than fifteen minutes, the cast member will write a time to return to the attraction. The return time will be the current time plus the posted wait time. For Example: At 2:00 pm the posted wait is 50 minutes. Your return time will be 2:50 pm. 5. When you return to the attraction at your appointed time, show the pass to the cast member and they will direct you where to enter the ride queue, typically the Quick Queue line. 6. You need to return to the ride within one hour of the time written on the pass. A potential problem with this new procedure is persons who have trouble understanding they have to get a return time instead of entering the ride’s line immediately. To help minimize this issue, we recommend that one member of your party obtain returns times for the attractions and then take your family member to the ride at the return time to avoid confusion or potential meltdowns. Note for those guests who are season pass holders: SeaWorld allows us to keep the assistance pass for two weeks with the expiration date listed on the pass. ​​​Has our website been helpful? Use our Amazon affiliate links whenever you purchase items from Amazon.com. There is no additional cost to you and we receive a small percentage of all completed orders.